Having completed only one day of testing in warm and sunny conditions at Valencia all elements of the Winston Ten Kate squad have declared themselves happy with their early progress. Lap times have already been trimmed when compared to 2005 qualifying performances, with both Superbike and Supersport teams working through a host of possible set-ups on the dry track. For 2004 World Champion James Toseland, a break into the 1'35 bracket was a dream start too his latest test session in his new team, and he concentrated on getting to know the 2006 Honda CBR1000RR Fireblade. His team-mate Karl Muggeridge working through an extensive list of set-up options, accumulating data on suspension and chassis settings. "The first day has been great, especially after the weather wasn't so good at our previous Almeria three-day test. We tried out some new parts there, which seemed to work well despite the poor conditions, and we knew that those parts would also work around here. That has certainly proved to be the case. The bike is the same spec that James rode at Almeria and from mid-morning onwards things have been going very well. The times he has been clocking on race tyres are particularly good, and he managed to get into the 1'35s by three PM. With Karl we are doing a lot of back-to-back tests, again on things we worked on in Almeria, but now through the full range. Karl has put in a lot of testing work for us, but as James in new to both the team and the machine we kept him out for a lot of laps. There will be more opportunities and more to come from Karl tomorrow." "I'm very satisfied with today. We had a good setting at Almeria, and about the same settings here - we have only had to make one or two clicks on the suspension. I also tried different front and rear tyres. I have never been in the 1'35s here, not ever, and to be in the 1'35s already on race tyres is great. The last time I was here I was in the 1'37s, so to go into the 1'35s, and see so much progress, is really good. We will try some different front forks and shocks but at the moment everything seems to be going really well." "So far today we have been successful in trying out new stuff on the bikes. I tested out some new forks and shocks, finding better suspension settings, things like that. As far as lap times are concerned, we haven't really tried yet; we are just concentrating on the bike. We're just using standard tyres and working on the rest. Tomorrow we have one more set of forks to try and then we can start working with the new tyres, to get the whole thing to mesh better. But today has been pretty successful." 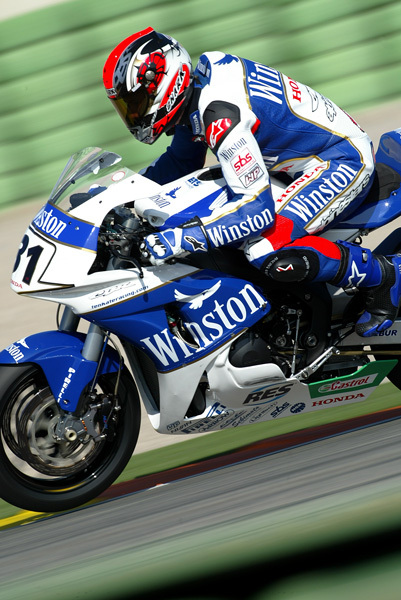 In the last test before the start of the 2006 World Superbike season the Winston Ten Kate Superbike and Supersport squads, running in 2006 livery for the first time, made their final on-track preparations for the first round of the championship in Qatar. James Toseland and Karl Muggeridge each improved their times from day one gaining great confidence on their full 2006 spec machines. "We are very happy with where we are at this moment. On the Superbike side of things, when I look back to the beginning of last season, we were around 70% ready to go racing. At the moment we are now about 95% ready. In the upcoming week we will fine-tune all the details but the riders feel very well connected to the machines, and have a good feeling with the throttle. Also, the suspension is better and the tyres are working very consistently over race distance. That will be the key factor, I think, in the coming races. We are ready, ready to rumble!" "We did a race simulation, and it was pretty good. The only other thing we could have done is make the long run at lunchtime, instead of a quarter past four, when the track was colder and the grip level is not so hot. It took two whole days to work through everything we had to test here, but it was OK, and we put together the best bike we could. I think we have really good info from here and we can even improve the bike again before we even start. We've had a good test." "For me this test has mostly been about time with the bike. Getting to learn it even more, doing quite a few laps and I tried the qualifying tyres for the first time on a Honda. The first one I put in I was a bit tentative with but on the second one I did a decent time. We went round in circles a bit this morning, so we didn't really improve until this afternoon. We worked on the tyres and then right at the end we changed a bit of the set-up and it gave us another improvement. I think we are nearly there now, largely because of the tests at Almeria and here. I'm looking forward to Qatar, especially with the amount of improvements we have made since the last time we were there."